If you’ve read material on chronic obstructive pulmonary disease (COPD), you’ve probably seen COPD facts referencing emphysema. But what is emphysema? Radiographs of the lungs will tell your doctors whether or not you have emphysema, a disorder involving the alveolae at the extreme terminus of the bronchii. Inside the lungs, there is a branching system of progressively smaller tubes (called bronchial tubes), at the end of which are air sacs (called alveoli). The alveoli have very thin walls, and are surrounded by capillaries (the smallest blood vessels). When you breathe in, oxygen and carbon dioxide travel through the bronchioles to the alveoli, and then pass through into the capillaries, where they are absorbed by red blood cells. This “oxygenated” blood travels to the heart, and then the rest of the body. At the same time, carbon dioxide from the blood in the capillaries passes into the alveoli, to be passed out of the body when you exhale. This exchange of gases—oxygen in, carbon dioxide out—takes just fractions of a second. But emphysema symptoms can prevent it from happening in the way it should. 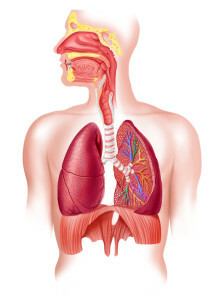 The bronchi, bronchioles, and alveoli of the lungs are normally very elastic. They easily stretch and then return to their original size during the process of breathing. The alveoli fill up with air like tiny balloons when you breathe in, and then easily deflate with each exhalation. With emphysema, the walls between many of the alveoli are destroyed and the airway loses much of its normal shape. As a result, the airways and alveoli are no longer able to bounce back to their original shape, especially during exhalation. Some of the airways collapse, and consequently some alveoli don’t properly deflate. This process can happen due to smoking (and exposure to secondhand smoke), long-term exposure to air pollution, factory dust, and chemical fumes, or because of genetics (people with a hereditary disorder called alpha-1 antitrypsin deficiency are at greater risk for emphysema symptoms, especially if they smoke). Collapsed airways become narrow, which obstructs normal airflow. When airways collapse or alveoli are destroyed, air can get trapped in the lungs. This causes parts of the lung to become enlarged (hyperinflated). Destruction of the alveoli also hampers the exchange of oxygen and carbon dioxide. This leads to too little oxygen and too much carbon dioxide in the blood. You may notice that you’re always tired and short of breath (this is one of the main emphysema symptoms, but it can occur so gradually you may not be aware of it), and that your lips and fingertips look bluish (this is due to lack of oxygen). The chemicals in cigarette smoke degrade the walls within the alveolae, which compromises elasticity. Emphysema sufferers can’t completely expel air, which means they can’t completely take in air. The result is a slow loss of blood oxygenation and resulting fatigue. Effective emphysema treatment is vital because emphysema symptoms can lead to complications that impact life expectancy—for example, a collapsed lung, and large cavities in the lungs (called bullae) that raise the risk for a collapsed lung. Emphysema symptoms also can weaken your heart function, which also can reduce emphysema life expectancy. Unfortunately there is no such thing as an emphysema cure. But drugs called bronchodilators can help your breathing by expanding your airways. There are two main types of bronchodilators—beta-agonists and anticholinergics—and each is available in a short-acting and a long-acting formulation. You also may be given steroids and antibiotics—find out more on our COPD medications list, and also check out some of the COPD home remedies that can help increase emphysema life expectancy. If you still smoke, it is vital to stop. Quitting smoking is recommended by COPD treatment guidelines, and can make a big difference when it comes to helping you avoid COPD complications. If your emphysema symptoms are occurring because of alpha-1 antitrypsin deficiency, you may be given a concentrated form of this protein, which has been removed from donated blood and purified. This therapy cannot reverse damage that has already been done by your emphysema symptoms, but it may slow down the further decline of your lung function. Pulmonary rehabilitation, which consists of a series of educational and structured exercises, also can help, and is recommended by the GOLD COPD guidelines. For severe emphysema symptoms, supplemental oxygen may be prescribed, or your doctor may suggest lung volume reduction surgery to remove parts of your lung that are most heavily damaged by emphysema. The surgery isn’t an emphysema cure, but it may help to relieve symptoms and may prolong emphysema life expectancy in some people. antibiotics, antitrypsin deficiency, copd, copd complications, copd guidelines, copd home remedies, copd medications, copd medications list, copd signs, copd signs and symptoms, copd treatment, copd treatment guidelines, emphysema, emphysema cure, emphysema life expectancy, emphysema symptoms, emphysema treatment, gold copd, home remedies, lung diseases, lung diseases list, lung emphysema, protein, pulmonary rehabilitation, smoking, supplemental oxygen, tired, what is emphysema. I have had emphysema for about five years. I was on oxygen during the day but not at night. I could go about two hours without the oxygen, and then I need it. I had a converter in the house and oxygen tanks for when I go shopping, etc. I am 64 years old and in relatively good health. The doctor said it was caused by a combination of smoking, dust here in Vegas, and 30 years of smog in California. I believed I will always need the oxygen to breathe. I quit smoking 15 years ago. But the damage has been done. January 2017 my pulmonologist and I decided to go with natural treatment and was introduced to Green House Herbal Clinic natural organic Emphysema Herbal formula, i had a total decline of symptoms with this Emphysema Herbal formula treatment. Visit Green House Herbal Clinic official web-site greenhouseherbalclinic The infections, shortness of breath, fatigue, dry cough and other symptoms has subsided. I am very pleased with this treatment. I breath very well now and exercise regularly, sometimes i totally forget i ever had Emphysema, I am thankful to nature, the medics failed. Share with friends!! I thought you might be interested in this article on https://universityhealthnews.com: What Is Emphysema?